This program includes an afterword read by W. Bruce Cameron. When Buddy is reborn, he realizes that he has a new destiny. He's overjoyed when he is adopted by Clarity, now a vibrant but troubled teenager. When they are suddenly separated, Buddy despairs-who will take care of his girl? 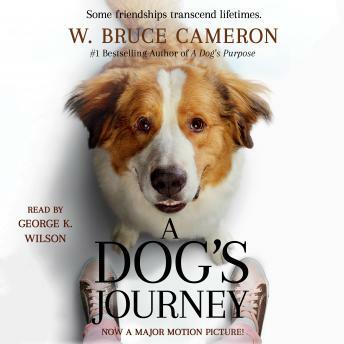 Directed by Gail Mancuso (TV's Modern Family, Roseanne), A Dog's Journey is once again produced by Gavin Polone (A Dog's Purpose, Zombieland). Mancuso directs from an adapted screenplay by Cameron & Cathryn Michon and Wally Wolodarsky & Maya Forbes, based on the book by Cameron. The film from Amblin Entertainment and Walden Media will be distributed by Universal Pictures. A charming and heartwarming story of hope and unending devotion, A Dog's Journey is the moving story of unwavering loyalty and a love that crosses all barriers. Fabulous book! I enjoyed it immensely. Even though there are moments of sadness, the book gives a very real sense of how our canine companions see us and relate to us!! Loved it!! Great book. Loved listening to it. I liked the story very much. The recording was not great. I tried multiple times to download a good copy to no avail. I'm not happy with this app. I absolutely loved this book and thought the narration was great! It's an easy listen and the narrator did a great job bringing the characters to life. I'm confident that anyone who loves dogs and understands/values the human-animal bond will very much enjoy this book. I wish the first series of this book was available as an audiobook! I wish I had known about audiobooks long time ago. I really like text being read aloud to me. I live in NYC and audiobooks app keeps me company on the subway while waiting for my train. I also like the booklist and I'm excited to listen to all my favorite books! The app is also fast and so far I have not encountered a problem yet. I hope not! Great app and I highly recommend this! Happy listening! If you loved A Dog's Purpose you'll love its sequel. The ending is beautiful, get the box of tissues ready. Trigger warning: one of the characters in the novel deals with an eating disorder. Had a few quality problems with my download...certain spots, despite being 100% buffered and downloaded, were distorted and impossible to listen to. Very odd. I've downloaded this audio book many times from different sources and this is the first time I've had that issue.